Because there's more to come! It's a lot of piecing let me tell you! But I think the cutting actually took longer than the piecing did. Luckily for me I have a Marti Michell template that was the perfect size for the little triangles - and that meant they have the little notched corners that make everything line up so nicely. The squares were cut with a regular ruler, but they were a funky size at 1 9/16". I got them all done though, and it'll be easier from this point on. 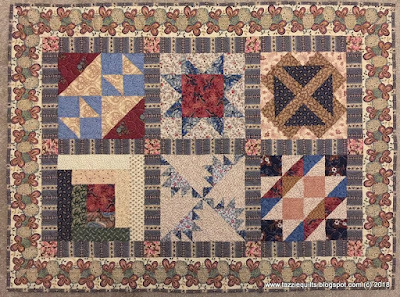 If you've made the quilt, or are working on it, or even if you have the book, you'll see that I didn't stick exactly to the instructions - at the ends of each border strip, there is a half square piece, and I chose not to do that. It makes little difference to the look of the quilt, but I just thought it was a neater finish. Next up is another skinny dark border like you see prior to the pieced border, and then another triangle/pyramid border. I have some pieces cut out ready for that one, but there will be a lot more cutting in my future. If you'd like them, just pop me an email and I'll be happy to send them to you. A big thank you to the commenters on my last post, I always love to hear from you. And Hello to some 'new to me' visitors, Momto1 and Lisa Dziuban - great to hear from you too! 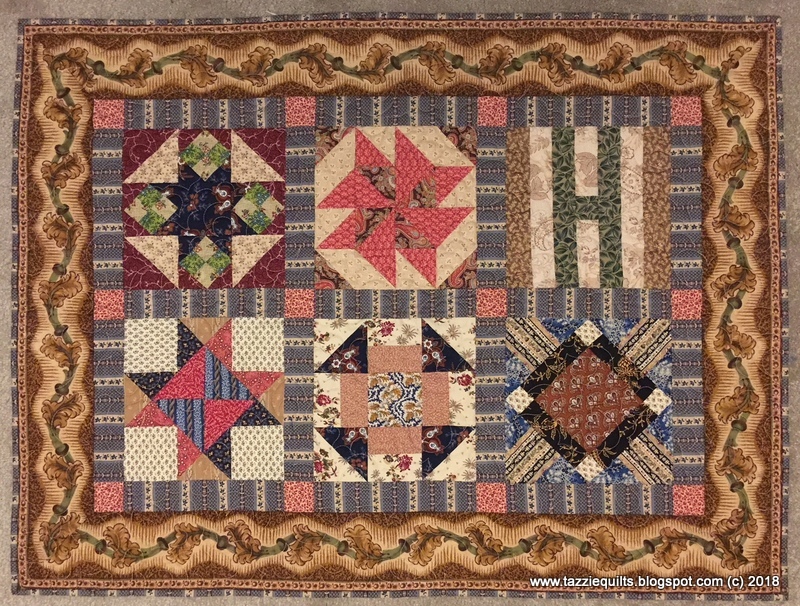 Lisa mentioned that this is a great stash busting quilt, and that's true, it really is. Though I have so many scraps I never seem to see a reduction in them. Hi everyone, thank you all for stopping by and commenting on my last post. Seems the comments thing still isn't working which is a little irritating. On the last post I left a comment of my own, and subscribed to replies which meant that I did receive an email that I'd received a comment, but there was no address provided for me to respond to. I may be able to reply if I still have your address on file from a past communication, but other than that, who knows? Is anyone else having the same issues? Anyway, let's get on to the quilting ... I can't remember if at the time of the last post I had all of the first triangle border in place, but that's definitely complete now. And the subsequent skinny border is in place too. It is only an inch cut, so half an inch finished. I've also pieced the next top and bottom borders which are made up of small squares and triangles, and I've stitched one to the body of the quilt. So much cutting and piecing! I have a bunch more cutting still to do before I can make up the borders for the sides, but once they're done I feel like this quilt is really moving toward the finish line! 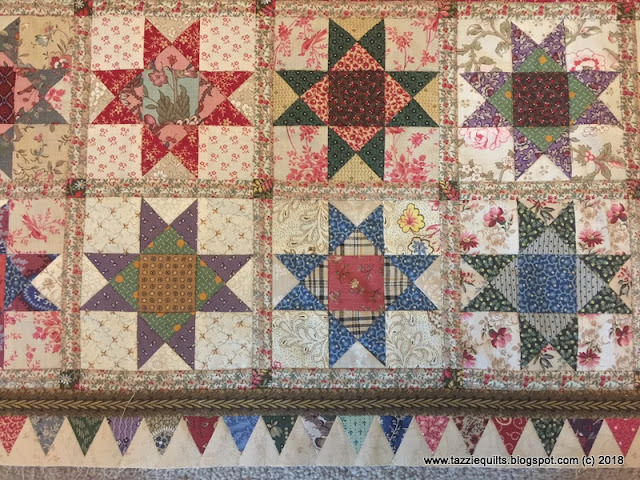 After this pieced border, it's pretty much a mirror image of the borders I've done already, a skinny dark border, another triangle border, a marginally less skinny border, and then I move to the final pieced border made up of star blocks. 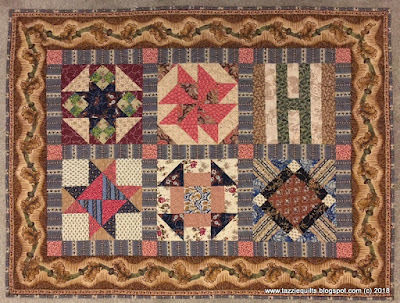 My lovely friend Lizzy will baste the quilt for me when I'm done, and then I can get busy hand quilting once again. I'm really looking forward to it! It fitted just perfectly, no easing required, so I'm confident that everything is going to be great with the next few borders going forward. The finish line for this quilt top is inching closer! There are a few more fabric oldies amongst the triangles - the pale green one near the centre is from the Smithsonian collection, and I want to say it's probably from the late 90's. And from a similar era the fifth triangle from the right is from the Oakland Museum collection sent to me by my lovely friend Linda. It's always fun to see such cuties pop up in my scraps - I used those in my Dear Jane way back when - and to think I was still such a beginner quilter I had no idea what I was taking on! 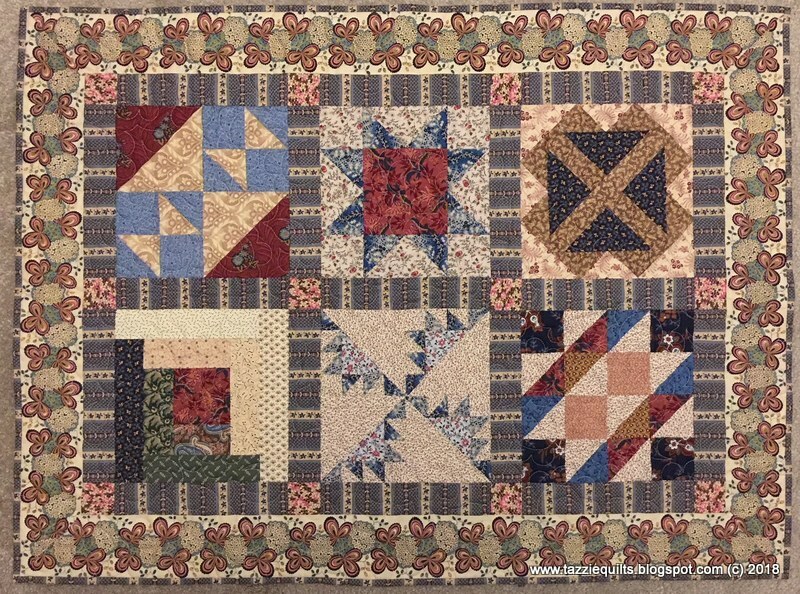 The blocks were from one of Barbara Brackman's block of the month quilts a while back, and though I didn't continue making all the blocks, I really liked the ones I'd made and saved them for something special. Combined with some favourite border prints and stripes, I think they came out as quite pretty table toppers. And last of all - in the last post I mentioned that Blogger seemed to be having a problem emailing comments at the moment. It seems like it's a common issue, and though information is hard to come by, I've read that they're working on a fix. I don't know if that's correct or not, but I really hope it is, as I enjoy interacting with you all, and answering questions when needed. Please continue to drop me notes, as I feel like this will simply turn up fixed one day - but perhaps if you have a particular question just email me. And to that end, Sandra asked me recently about tutorials for drawing on Corel draw - I'm sure you can google some. But if you send me your email address, I'm happy to send you the one I did already. Piecing this way always looks kind of jiggly wobbly until it's trimmed at the end, but at least I can be sure all these points are going to be perfect when they're stitched to foundations. Each row has 62 coloured triangles and a similar number of them in background fabric, and I'm piecing the four borders in tandem so I can keep the fabric placement consistent. This means I have a whole bunch of tiny pieces to play with over the next few days - looking forward to attaching these borders to the main body of the quilt will keep me motivated, otherwise it's pretty mindless piecing. Do you see that pinky coloured fabric third from the right up there? My goodness that one has some age on it. It's from the Sarah Johnson collection and I'm guessing it's close to 20 years old - amazing how these oldies turn up in my stash! I remember it was a huge purchase for me at the time - I got a skinny quarter of the whole collection from a local quilt store. Being a fairly new quilter at that time I thought it was really extravagant, but it's much more common now to participate in that kind of stash building. Having said that, I'm pretty sure I have enough fabric to last until the end of time, but it doesn't seem to stop me from adding to it! !